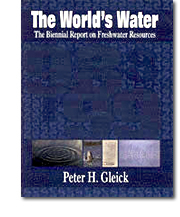 The first volume of The World’s Water (1998-1999) includes chapters on the changing global paradigm for water management and use, the environmental implications of large dams, possible consequences of climate change, and the links between water resources and conflict. The book also contains more than fifty charts, tables, and maps that present data on a range of topics including the availability and use of water, numbers of threatened and endangered species, dam and desalination capacity worldwide, and much more. Order directly from the Island Press website.